In Sweden, we celebrate Luciadagen (Lucia Day) on the 13th of December every year. Besides the wonderful concerts, the tradition of eating Lussebullar is also very popular. Especially the combination of a Lussebulle and a cup of Glögg. We from the Misi Test Panel Team wanted to find out: Where do you get the best Lussebullar in Gothenburg and tried out some of the town's most famous places. 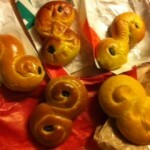 Smell: This Lussebulle smelled doughy and we could not smell any saffron at all. Look: Really nice looks. It had a perfect shape and was pefectly yellow inside. We could even see the saffron bits clearly. We were amazed by how glossy and shiny the Lussebulle was. It was outstanding. Taste: It was sweet but not too sweet. We could taste the saffron and it was soft and juicy. But there were a lot of raisins inside. One poor test panel member had a raisin in every little bit he took. That was just too much. Look: This Lussebulle had a perfect shape as well. It was perfectly rolled and the raisins had a perfect position in the middle. It had a nice yellow-brown colour on the outside and we were hesitating to eat it… We were looking very carefully for bits of saffron – and we eventually found some. Taste: It was not as sweet as the others and it was a little bit dry on the edges. But we were very happy with it. 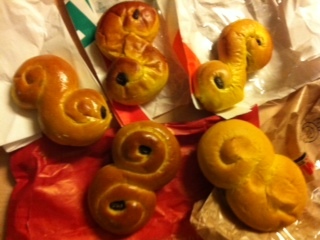 Plus: The Lussebulle came in a red paper bag with golden letters. This made us not only feel very exclusive, but also put us in a Christmas mood. Smell: It smelled freshly baked. Look: This was the only one that had the 8-shape and no raisins at all. It was also the largest but cheapest one. It had no glazing at all. Taste: The Lussebulle was very soft and easy to break. The taste was not as strong as the others. We could not taste the saffron very much and one team member thought it had quite a boring taste. But in general, we thought this Lussebulle was completely acceptable. Smell: It smelled very strongly like yeast. Look: It looked extremely soft but was actually quite hard when we broke it. It had partly a glossy treatment and there was no glazing at all on the sides. It had a typical S-form. Taste: We could not taste any saffron. The yeast taste was too strong to taste anything else. It works perfectly if you want to eat some bun to your coffee but as a Lussebulle it did not really convince us. Smell: It simply smelled like a “Vetebulle” (a regular bun). Look: We really loved the design of this Lussebulle. It looked like an italic and stylish S-formed Lussebulle. But at the same time it also looked dark brown, like it was too long in the oven. Taste: It was quite hard and very thick. It had quite a dense taste which was not appreciated by all team members. It was also quite sweet. We found that there was a big difference between the Lussebullar you get at a bakery and at a convenience store. The ones from the bakeries were so much better when it comes to smell, looks and taste. When you only want to buy one or two Lussebullar we strongly recommend to buy them at bakeries because there is almost no price difference but the taste is a lot better. We also recommend Brogyllens Lussebulle if you like raisins and Steinbrenner&Nyberg if you like Lussebullar that are not too sweet.